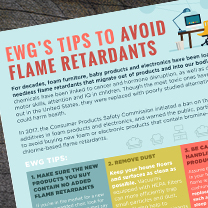 At EWG we’re committed to helping you create the best environment for your family — free of dangerous chemicals and wasteful material. 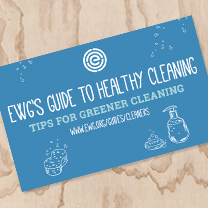 EWG’s fans and followers are constantly asking us for tips to help them create cleaner and greener homes that are good for their families and the planet. 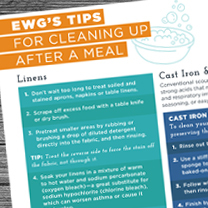 With our guides, EWG is bringing it back to the basics. Thank you for celebrating two decades of work by following our smart solutions to healthier living every day! Tips on stain removal for your tablecloths and napkins and cleaning your favorite cast iron skillet and copper cookware. 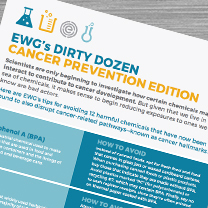 Many personal care products contain troubling ingredients that have either been linked to harm, including cancer and endocrine disruption, or have not been adequately assessed for safety. 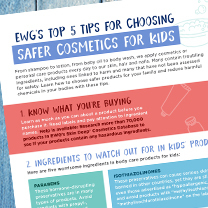 Read EWG’s tips for choosing products without these pesky chemicals. 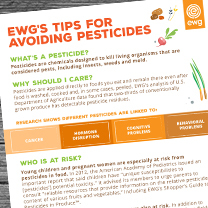 Conventionally grown fruits and vegetables are often contaminated with pesticides, some of which have been linked to cancer and hormone disruption. There are simple steps that you can take to reduce your intake of these harmful chemicals. For decades, home furniture has been laced with needless, toxic flame retardant chemicals that can get into our bodies. There are steps you can take to protect your family from these harmful chemicals. 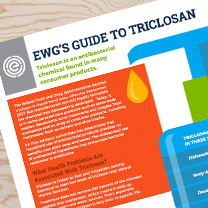 The FDA has banned companies from using triclosan, a potential endocrine-disrupting chemical and aquatic toxicant, in liquid hand soaps. But it is still allowed for use in many other consumer products. Toxic nonstick chemicals are found in a variety of different consumer goods, including cookware, furniture, clothing and fast food containers. 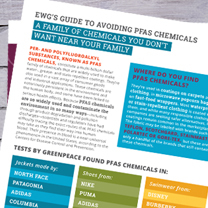 Avoiding these chemicals takes a watchful eye. Drinking plenty of good, clean water is important for a healthy body. But there are more than 200 contaminants found in our nation’s drinking water. Find out what steps you can take to reduce your exposure. Airborne pollution can contribute to all respiratory diseases, including asthma, and may be especially problematic for children. 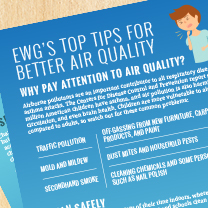 There are some simple steps you can take to reduce your exposure to air pollution. The federal government doesn’t require cleaning product makers to disclose their ingredients to the public. Toxic ingredients are used in a number cleaning products and, often, there’s no way of knowing what’s in the bottle. Studies indicate that cellphone radiation can harm the brains of both adults and children. 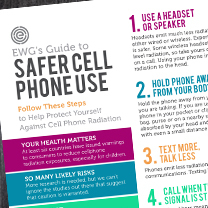 Though more research is needed, there are some simple steps you can take to help reduce your exposure to cellphone radiation. More than 1 million people in the U.S. are diagnosed with cancer each year. 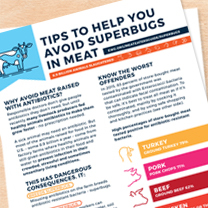 While the precise causes of the disease are not yet fully understood, there are some things you can do to reduce your risk. If you spend time outdoors, use an appropriate bug repellant. 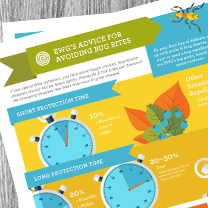 Bug-borne diseases should not be taken lightly. 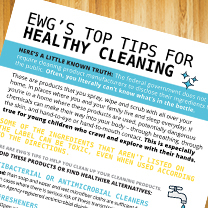 Here are some quick tips for choosing healthier household cleaning products. 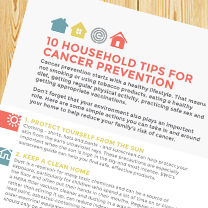 Here are some simple actions you can take in and around your home to help reduce your family’s risk of cancer. 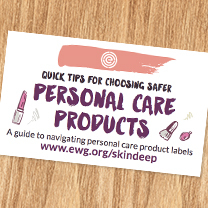 Here are some quick tips for choosing safer personal care products. 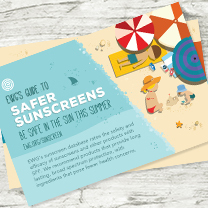 Here are some quick tips for choosing safer sunscreens. 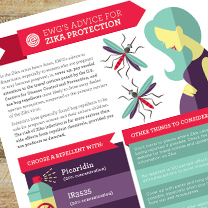 Check out EWG’s tips for avoiding the Zika virus. 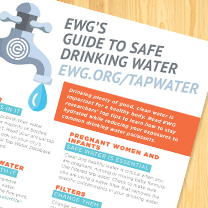 EWG welcomes requests to reproduce EWG tipsheets. To request permission, please email a completed request form to [email protected], fax it to 202-232-2592, or return it by regular mail to EWG Headquarters. Should EWG grant your request, you agree to the terms and conditions found here. EWG reviews requests on a case-by-case basis and reserves the right to deny permission for any reason, in its sole discretion.